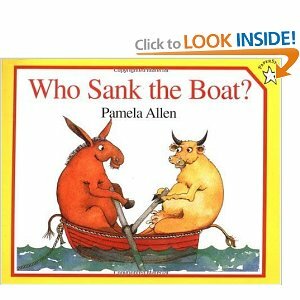 Five friends: a donkey, a cow, a sheep, a pig, and a mouse, all decide to go for a boat ride. They enter the boat from biggest to smallest with each new entrant tipping the boat and causing it to sit lower and lower in the water. Guess who gets in last. Guess who sinks the boat. The rhyming text is rollicking and as exuberant as the passengers. Its predictability makes this a good early reader. The "straw that broke the camel's back" theme in this book is easily identified. Ø A better/safer way to get into and out of the boat. Ø How to design a boat large enough to fit all the animals comfortably (including room for the sheep to knit). Ø Design a boat to fit animals and that will not sink. Ø How to fix a broken/sunken boat. Give children some toy boats or some wooden triangular wedges and some stones or weights and let them figure out if the mouse would have sunk the boat if he had gotten on in any other position than last. Change the story with a new sequence of animals? Is it as funny? Estimate the weight of each of the characters. Then calculate the necessary size of the boat.